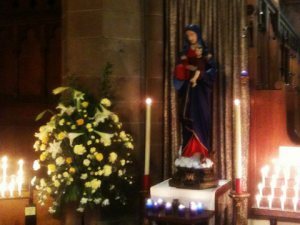 YES to Easter – St C’s Campaign for a Real Eastertide! This parish in Manchester has provided a list of things we can do to help spread the joy of Eastertide for the fully 50 days. To see the list, click on ‘View original’ link to read their original post. The Easter Season lasts 50 days. Significantly it is 10 days longer than the season of preparation for Easter – Lent. Now, in Lent some of the things we do are consider our lifestyle (what we are ‘giving up’), deepen our faith and prayer (what extras we will take on in church) and think about our beliefs (what we will read). How will we keep the glorious fifty days of celebration for the Resurrection of Our Lord? This was the question Fr Ian invited us to consider at the end of Mass on Easter day. Easter is a season of glory, a time to broaden horizons of faith and life, to share our joy, to be open to prayer, silence and wonder. The Easter season finishes on Pentecost Sunday (this year on May 27th). This entry was posted in Anglican church, Spirituality and tagged Easter. Bookmark the permalink. Just a small correction to the original post from St C’s – this year Sunday June 8 is the Day of Pentecost (not May 27th).